The Advance SC8000™ rider scrubber is the definition of innovative and optimized design. This maneuverable front steer scrubber houses the widest cylindrical scrub deck in its class. 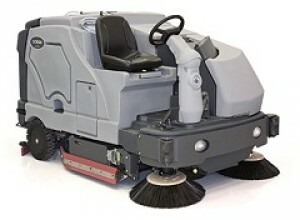 This deck’s dual counter-rotating cylindrical brushes are capable of sweeping and scrubbing in a single pass.DustGuard™ suppresses and controls dust using a “fog” at the side broom. Using Advance’s One-Touch™, the entire scrub system is activated simply by the press of a button. Four different cleaning systems allow you to customize the scrubber to your facility’s needs. Cleaning paths up to 62 inches are available on the SC8000. This coupled with the efficiently packaged 100 gallon solution tank delivers the capability of cleaning up to 100,000 square feet per tankful under normal scrubbing speeds.